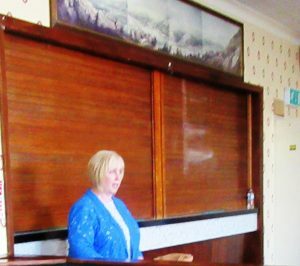 The meeting was attended by about 20 residents who were welcomed by South West Wales AM Mrs Suzy Davies. 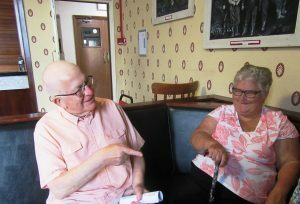 She said that she had been involved with the original fight to save the Resolven surgery from closure but that fight was over and it was now a question of trying to improve access to the new health centre at Glynneath when it opens in the spring by ensuring that bus services are adequate. N PT County Borough Councillor Des Davies said he had met with NPT Council transport officers who liaise with bus company chiefs. He has joined forces with all other councillors representing the Neath valley. Des told the meeting that he was told First Cymru would be introducing a new time table from September but there is only one change proposed for local services and that was to move one bus time by 11 minutes. 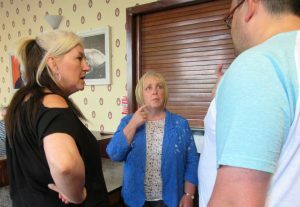 He will check to see if any further changes are proposed but because of the registration regulations, a certain period of notice must be given to the council before any changes come in and nothing has been proposed yet. He said that after the bus company changed from a half hourly to an hourly service for Resolven in January, he had been in touch with Alex Davies who is the practice manager at the present Glynneath surgery and he will be running the new centre. The practice wrote to First Cymru in February protesting about the cuts but the reply stated that there was not enough patronage to justify the half hourly service. The practice will get back in touch when the new health centre is due to open to see if there could be an increased frequency of buses to match surgery times. Des said that ABMu is behind schedule in drawing up its Transport Plan for the new health centre. When the new health centre at Briton Ferry was opened, extra buses were laid on for patients to get to it. Why not Resolven? Des said that all they could do was push ABMu to produce the transport plan. He said they need to pull their finger out. People living in Abergarwed were also affected and there was a need to co-ordinate the bus services..
Des said that he had had talks with DANSA (Community bus service) but there was a danger that if they ran bus services in competition with First Cymru, FC will pull all service. At least there is still an hourly bus. The risk was that Dansa or a rival bus company would not be able to sustain an alternative service leaving people with nothing. Local, Mrs Susan Elias, said that the existing service does not meet all the needs of villagers. People attending Neath Port Talbot hospital had a problem with getting buses once they are only hourly. Also, she said that the early service is so full that it is passing people in Tonna because there is not enough room. People with prams are also prevented from getting on because of space issues. A gentleman who uses the buses wrote to the company and he had a reply saying that they will not revert back to having a half hourly service. It was also stated that buses were not going up to Pont Walby and Ponthneathvaughan because the company says that there is no time for a turn around. Yet buses stop at Tonna for up to 5 minutes and also wait in Glynneath. Susan also pointed out that First Cymru are operating buses along the main Neath to Port Talbot route every 15 minutes and they are often running empty. Suzy said that with Dansa there would be a risk that if they operate too many commercial trips, they could affect their licence as they are a community bus service. She said that while they can plug gaps in services on commercial routes, they have to be careful of crossing a line and becoming a fully commercial service which would affect their registration. Susan Elias also pointed out that the Dansa buses travel into the estate where she lives but to catch a First bus, people had to get down to the main road. This would be a problem for some patients as they try to get to the new health centre. Des said that nothing much could be done at present until ABMu produced their transport plan when people would be able to see exactly what is being proposed. Also, they need a firm date for the opening of the new health centre to try and co-ordinate bus services. He said that once the centre is due to open, they can again make the case for a half hourly service because there would be a guaranteed additional patronage of the service. While it was stated that someone had been told by the bus company that most of the users were using bus passes, Suzy pointed out that bus companies get paid for every journey made using a bus pass so they do get income from those journeys. One lady pointed out that there was also a knock-on effect on people using the buses to get to work. She said some people were getting to their place of work an hour before time because if they wait for the next bus, they would be late. Coming home, some people are having to wait 45 minutes or more for the bus home as a result of the loss of the half hourly service. Des said that all five councillors locally were working together to gather evidence to put before the bus companies. Suzy told everyone to write in letters – she said a petition often counts as only one objection. She said that the more case studies of how people are affected, the stronger the arguments would be. Des said that to date, the bus companies were only interested in profit. He said that NPT Council were carrying out some work on this themselves especially as some councils run their own bus services. He said if Briton Ferry could have extra services to take people to their new health centre, why couldn’t this happen for Resolven? One of the suggestions made was that extra buses be put on at peak times when people are going to and from work and also perhaps to co-ordinate with surgery opening hours. The rest of the time, an hourly service would probably be adequate. Des said that they need to see the ABMu transport plan asap so that they can make suggestions. But this required three to four months and then the bus company needed time to register new services. There may also be a consultation period for the new plan. One man pointed out that bus services were needed to promote tourism, He said that the Neath Valley had many places of interest from the falls at Pontneathvaughan to the canal, the Aberdualis Falls and many walking and mountain biking routes. Suzy said that this was a good point and that different budgets within Welsh Government could be sourced to provide funding for these services. The tourism minister may provide some funding with perhaps the health minister and local government minister providing more. Des said that NPT officers had put the suggestion of peak hours services to the bus comany. They have suggested having a half hourly service between 8.30am to 11am and then later in the day for people coming home. He said that pressure needed to be put on bus companies. Asked about subsidies from NPT council for bus services, Des said that they are used to provide services to communities that have no services at all.